Don't be afraid that you will miss the ferry in the morning, sleep in and stay with us, only 60 metres from the terminal. Enjoy a great view over the mountains and eat well in our newly renovated restaurant. Our Syv Søstre Restaurant is recently renovated and serves food with a local touch. To sweeten it up some more we also want to tell you about the delicious pastries we serve here. We arrange food theme nights regularly and you can order take away. We serve lunch and dinner, everything from lighter dishes to à la carte. Our bar, overlooking the Alstenfjord, can offer you a selection of coffee and drinks. 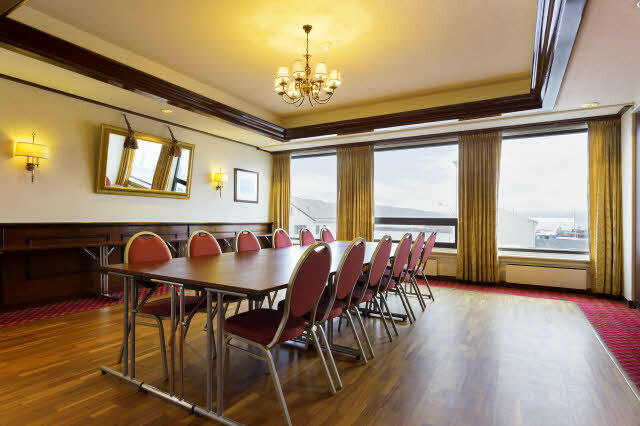 For your next conference we have 5 meeting rooms with natural daylight and air conditioning to choose from. As a guest you'll have access to free WiFi and parking outside. Our hotel is located west of the mountain range De syv søstre (The seven sisters) on the Helgeland Coast. Many of our rooms have a view of the mountains or the sea. The Hurtigruten Ferry Terminal is close by and the surroundings offer you excellent outdoor activities. Many of our rooms were renovated in 2014 as well as the restaurant and public areas. The Sandnessjoen airport is 9 km away, a bike ride for some, but if you don't want to bike the bus stop is just outside the hotel. Scandic Syv Søstre is located close to the Seven sisters mountains, 9 km from the airport and 60 m from the Hurtigruten Ferry terminal. Conference capacity for up to 80 participants.